Suede Loop Lock Wrist Support (7in.) – Pacific Medical, Inc.
Perforated suede material with loop lock closure. 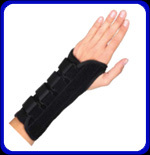 Ideal for post surgical immobilization, wrist sprains and strains. Recommended for Carpal Tunnel Syndrome and Tendonitis.